Friday 20 July 2018: Korean Air is celebrating a significant milestone today – 25 years of flying from Seoul, South Korea to Brisbane Airport (BNE). The Korean national airline first flew to Brisbane on 20 July 1993 and has established itself as the main carrier for hundreds of thousands of Korean tourists and business visitors. The market is at an all-time high, with passenger numbers increasing by 10,000 each year over the last few years, reaching more than 110,000 last year. In the last 12 months, Korean Air increased seat capacity to Brisbane by 5.5 per cent. Korean Air is working towards making its service to Brisbane even more enjoyable for its customers. Having recently moved into a brand new terminal (T2) at Incheon Airport, passengers will enjoy a direct train service from Seoul Station to T2, a seamless self-service check-in process, two dedicated prestige lounges, and a Kidz Zone and Entertainment Zone. 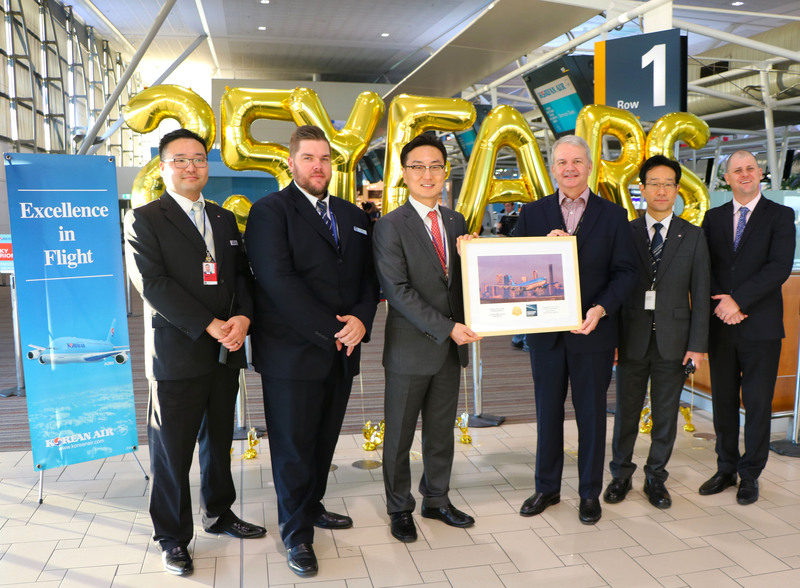 Andrew Brodie, General Manager Aviation and Retail Management Brisbane Airport Corporation, presented Korean Air representatives with a gift at the International Terminal this morning to mark the occasion. Passengers on today’s service to Seoul also received commemorative gifts on check-in. Korean Air has one of the world’s widest networks, with enormous connectivity to 127 cities across Europe, North America and Asia.